Marino, M., Sameshima, P. & Beecher, C. (2009). Enhancing TPACK with Assistive Technology: Promoting Inclusive Practices in Pre-service Teacher Education. 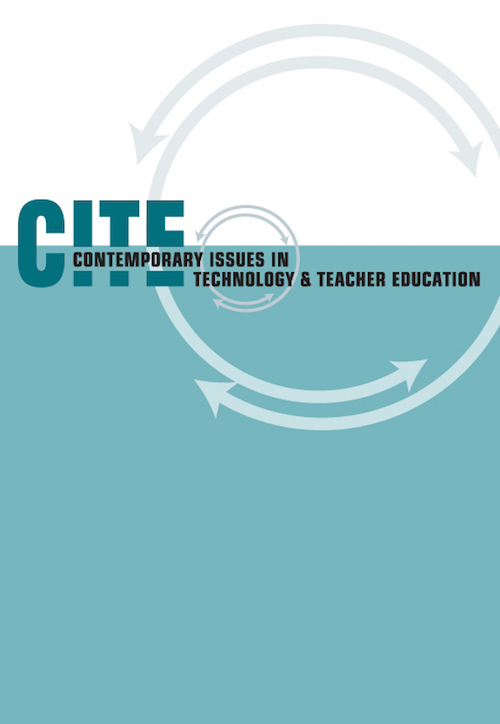 Contemporary Issues in Technology and Teacher Education, 9 (2), 186-207. Waynesville, NC USA: Society for Information Technology & Teacher Education. Retrieved April 18, 2019 from https://www.learntechlib.org/primary/p/30279/. Anderson, C.L., & Petch-Hogan, B. (2001). The impact of technology use in special education field experience on preservice teachers' perceived technology expertise. Journal of Special Education Technology, 16(3), 27-44. Bausch, M.E., & Hasselbring T.S. (2004). Assistive technology: Are the necessary skills and knowledge being developed at the preservice and inservice levels? Teacher Education and Special Education, 27(2), 97-104. Bishop, M.J., & Santoro, L.E. (2006). Evaluating beginning reading software for at-risk learners. Psychology in the Schools, 43(1), 57-70. Brown, M.R. (2000). Access, instruction, and barriers: Technology issues facing students at risk. Remedial and Special Education, 21(3), 182-192. Coiro, J., Klein, R.A., & Walpole, S. (2006). Critically evaluating educational technologies for literacy learning: Current trends and new paradigms. In M.C. McKenna, L.D. Labbo, R.D. Kieffer, & D. Reinking (Eds. ), International handbook of literacy and technology: Vol II (pp. 145-161). London: Taylor& Francis Group. Dwyer, D. (2002). Since computers came to school. Educational Technology, 42(4), 1718. Edelson, D.C., Gordin, D.N., & Pea, R.C. (1999). Addressing the challenges of inquirybased learning through technology and curriculum design. The Journal of the Learning Sciences, 8(3 & 4), 391-450. Edyburn, D.L. (2004). Rethinking assistive technology. Special Education Technology Practice, 5(4), 16-23. Edyburn, D.L. (2007). Technology-enhanced reading performance: Defining a research agenda. Reading Research Quarterly, 42(1), 146-152. Edyburn, D.L., & Gardner, J.E. (1999). Integrating technology into special education teacher preparation programs: Creating shared visions. Journal of Special Education Technology, 14(2), 3-20. Gersten, R., Fuchs, L.S., Williams, J.P., & Baker, S. (2001). Teaching reading comprehension strategies to students with learning disabilities: A review of research. Review of Educational Research, 71, 279-320. Glaser, C.W., Rieth, H.J., Kinzer, C.K., Colburn, L.K., & Peter, J. (1999). A description of the impact of multimedia anchored instruction on classroom interactions. Journal of Special Education Technology, 14(2), 27-43. Glover, T.A., & DiPerna, J.C. (2007). Service delivery for response to intervention: Core components and directions for future research. School Psychology Review, 36(4), 526540. Hannafin, M.J., & Land, S.M. (2000). Technology and student-centered learning in higher education: Issues and practices. Journal of Computing in Higher Education, 12(1), 3-30. Hooper, S., & Rieber, L.P. (1995). Teaching with technology. In A.C. Ornstein (Ed. ), Teaching: Theory into practice (pp. 154-170). Needham Heights, MA: Allyn & Bacon. Jonassen, D.H. (2000). Computers as mindtools for schools: Engaging critical thinking (2nd ed. )Upper Saddle River, NJ: Prentice Hall. Jonassen, D.H., & Hernandez-Serrano, J. (2002). Case-based reasoning and instructional design: Using stories to support problem solving. Educational Technology Research and Development, 50(2), 65-77. Kirschner, P.A., & ErKens, G. (2006). Cognitive tools and mindtools for collaborative learning. Journal of Educational Computing Research, 35(2), 199-209. Lahm. E. (2005). Improving practice using assistive technology knowledge and skills. In D.L. Edyburn, K. Higgins, & R. Boone, (Eds. ), Handbook of special education technology research and practice (pp. 481-489). Whitefish Bay, WI: Knowledge by Design, Inc.
Lancaster, P.E., Schumaker, J.B., & Deshler, D.D. (2002). The development and validation of an interactive hypermedia program for teaching a self-advocacy strategy to students with disabilities. Learning Disability Quarterly, 25, 277-302. Lange, A.A., McPhillips, M., Mulhern, G., & Wylie, J. (2006). Assistive technology tools for secondary-level students with literacy difficulties. Journal of Special Education Technology, 21(3), 13-22. Lewin, K. (2008). Force field analysis. Retrieved from the Value Based Management.net Website: http://www.valuebasedmanagement.net/methods_lewin_force_field_analysis.html. Marino, M.T., & Beecher, C.C. (2008). Assistive technology policy: Promoting inclusive education for students with reading disabilities. Northwest Passage, 6(1),14-22. Marino, M.T., Marino E.C., & Shaw, S. (2006). Making informed assistive technology decisions for students with high incidence disabilities. Teaching Exceptional Children, 38(6), 18-25. Mastropieri, M.A., Scruggs, T.E., & Graetz, J.E. (2003). Reading comprehension instruction for secondary students: Challenges for struggling students and teachers. Learning Disability Quarterly, 26, 103-116. Maushak, N.J., Kelley, P., & Blodgett, T. (2001). Preparing teachers for the inclusive classroom: A preliminary study of attitudes and knowledge of assistive technology. Journal of Technology and Teacher Education, 9(3), 419-431. McLaren, E.M., Bausch, M.E., & Jones Ault, M. (2007). Collaboration strategies reported by teachers providing assistive technology services. Journal of Special Education Technology, 22(4), 16-29. McNamara, D.S., & Shapiro, A.M. (2005). Multimedia and hypermedia solutions for promoting metacognitive engagement, coherence, and learning. Journal of Educational Computing Research, 33(1), 1-29. Meyer, A., & Rose, D. (2005). The future is in the margins: The role of technology and disability in educational reform. In D.E. Rose, A. Meyer, & C. Hitchcock (Eds. ), The universally designed classroom: Accessible curriculum and digital technologies. Cambridge, MA: Harvard Education Press. Michaels, C.A., & McDermott, J. (2003). Assistive technology integration in special education teacher preparation: Program coordinators' perceptions of current attainment and importance. Journal of Special Education Technology, 18(3), 29-41. Michaels, C.A., Prezant, F.P., Morabito, S.P., & Jackson, K. (2002). Assistive and instructional technology for students with disabilities: A national snapshot of postsecondary service providers. Journal of Special Education Technology, 17(1), 5-14. Parette, H.P., Huer, M.B., & Scherer, M. (2004). Effects of acculturation on assistive technology service delivery. Journal of Special Education Technology, 19(2), 31-41. Parette, H.P., & McMahan, G.A. (2002). What should we expect from assistive technology? Being sensitive to family goals. Exceptional Children, 35(1), 56-61. Pedersen, S., & Liu, M. (2003). Teachers' beliefs about issues in the implementation of a student centered learning environment. Educational Technology Research and Development, 51(2), 57-76. Peterson-Karlan, G.R., & Parette, P. (2005). Millennial students with mild disabilities and emerging assistive technology trends. Journal of Special Education Technology, 20(4), 27-38. Puckett, K.S. (2004). Project access: Field testing an assistive technology toolkit for students with mild disabilities. Journal of Special Education Technology, 19(2), 5-17. Rose, D.H., Hasselbring, T.S., Stahl, S., & Zabala, J. (2005). Assistive technology and universal design for learning: Two sides of the same coin. In D.L. Edyburn, K. Higgins, & R. Boone, (Eds. ), Handbook of special education technology research and practice (pp. 507-518). Whitefish Bay, WI: Knowledge by Design, Inc.
Rose, D.E., Meyer, A., & Hitchcock, C. (2005) The universally designed classroom: Accessible curriculum and digital technologies. Cambridge, MA: Harvard Education Press. Sameshima P., & Sinner, A. (2009). Awakening to soma heliakon: Encountering teacherresearcher-learning in the 21st century. Canadian Journal of Education, 32(2), 271-284. Schon, D.A. (1987). Educating the reflective practitioner: Toward a new design for teaching and learning in the professions. San Francisco: Jossey-Bass. Schrum, L., Skeele, R., & Grant, M. (2003). One college of education's effort to infuse technology: A systematic approach to revisioning technology and learning. Journal of Research on Technology in Education, 36(3),253-272. Thousand, J.S., & Villa, R.A. (2000). Collaborative teaming: A powerful tool in school restructuring. In R.A. Villa& J.S. Thousand (Eds. ), Restructuring for caring and effective education (2nd ed., pp. 254-291). Baltimore, MD: Paul H. Brookes. Wepner, S.B., Bowes, K.A., & Serotkin, R.S. (2007). Technology in teacher education: Creating a climate of change and collaboration. Action in Teacher Education, 29(1), 8193. Zorfass, J., & Rivero H.K. (2005). Collaboration is key: How a community of practice promotes technology integration. Journal of Special Education Technology, 20(3), 51-67.